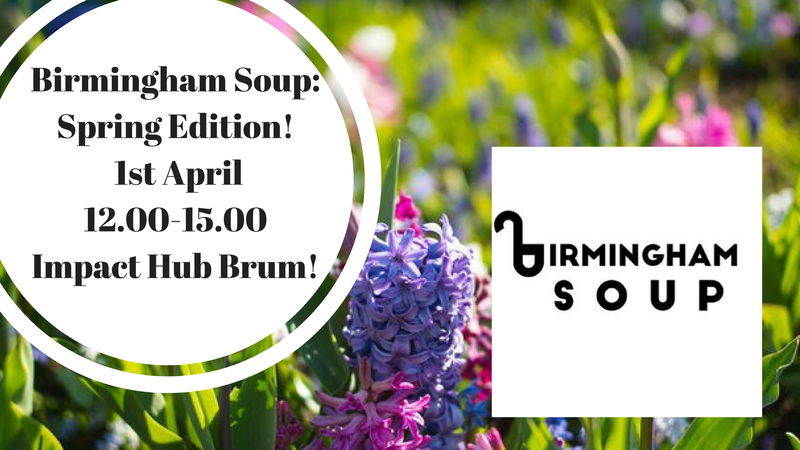 Spring’s Birmingham Soup is just around the corner! The next Birmingham Soup is 1st April – 12.00-15.00 at Impact Hub Birmingham! -Pay a suggested donation of £5 or more (£1 for kids). -Learn about creative/community projects happening in Birmingham. -Vote on which project to fund with the money raised from the dinner. We’d LOVE to see you on Valentine’s Day to help us spread even more LOVE throughout Birmingham and vote for another brilliant project. Join us for after work dinner with friends. Bring food to share if you can and listen to 4 project pitches. Each pitch gets just 4 minutes to share their idea and the audience gets to ask a maximum of 4 questions. When you’ve heard all the pitches you get the chance to chat to your fellow investors and the pitchers over some tasty food. Then, when you’ve decided who you think deserves the money the most, place your vote. The project with the most votes gets the money taken on the door that evening. Everyone is welcome at Impact Hub in Digbeth. We ask for a minimum donation of £5 on the door (more if you like). Doors open at 6pm for chats, it all starts around 7pm and is done by 9pm. IF you can bring food then you are very welcome – please note that we don’t have any heating facilities. IF you have a project you’d like to pitch then the application process is REALLY EASY! Just click the link here and take a look. Another inspiring SOUP took place in December with 4 more great projects, a load of lovely investors, some fantastic craft stalls and plenty of festive cheer. Well done to all of our project pitchers! As usual it was really hard to decide but it was Hannah’s ‘Don’t judge a book by it’s cover’ project that took the money. Read more about the projects here and if you’re inspired then how about pitching at the next event with our very simple application process? OK folks we were SO excited to get to out first birthday in October, and were totally on a high thanks to everyone that came and made it so special, that we forgot to add our lovely pics of the night. We made screen printed tea towels (designed by our very own Erin and commissioned in conjunction with Eye Candy), we had the most STUNNING birthday cake created by Have Some Cake, a mocktail bar created by Girl Dreamer and 4 excellent projects to vote for… What. A. Night! SO 1 year of #BrumSOUPS and what have we done? Well over 500 of you lovelies have generously invested almost £3,000 in 10 projects. You have listened to 38 people with projects tell their story and helped many of the projects with advice, assistance and knowledge. 10. Dibah – Welcome Walk (although Dibah shared her investment with Sharon from Square Peg, Ben from The Real Junk Food Project and Jodi from One Million Lovely Letters – so you could say we’ve had 13 winners). Our pot luck dinners have served up around 18 Soups (made by our talented SOUP makers from Bearwood Kitchen), countless delish salads and around 200 loaves (kindly donated by LOAF). By coming to *Impact Hub (*and thank you kindly guys for all the support and hosting us) you have helped to make a real difference to people’s lives. Beyond the people pitching the projects there are of course all the people that the projects help in Birmingham. Our next #BrumSOUP is a ‘Wonderful Winter Warmer’ where we’ll be offering you a safe haven to get out of the crazy pre-xmas shopping madness on Saturday 17th December at our home Impact Hub. It’s a family friendly SOUP so all-ages are very welcome. Doors open 11am and we start at 12noon. We’re getting super excited about out 1st Birthday party this Thursday at Impact Hub Birmingham with Eye Candy, Birmingham’s own festival of all things visual. GirlDreamer is part of mOmhead‘s empowerment platform for girls and young women on a mission to educate, elevate and empower through fashion, community events and school programmes. For Birmingham Soups 1st birthday, we will be hosting an exclusive GirlDreamer Mocktail Bar for the night. We’ll be mixing, shaking and stirring up a range of tasty and refreshing drinks. Live Screen Printing with INKwell – You can try your hand at screen printing and take home your own limited edition Birmingham SOUP Tea Towel. It wouldn’t be a birthday without cake, so be first in the queue for our specially made birthday cake, created by artisan cake connoisseur HAVE+SOME+CAKE. Tunes will be provided by the most excellent Bearwood Bandits, expect folk, blue grass and everything in-between. As usual SOUP will be freshly prepared and served by the hot chicks of the Bearwood Pantry and tasty Bread kindly donated by Loaf, Stirchley’s community bakery and cookery school. With a suggested entrance fee of £5, you the SOUP community will cast your vote and the project with the most votes wins the money taken on the door plus a generous top up fund from Eye Candy and will leave with the funds that evening. TAKE TO THE SOAPBOX AT SOUP. If you are able to bring some food or drink to share, you’ll have the option of taking to the SOUP soapbox for one minute, to share whatever you’d like with the audience. Please note that we don’t have a science oven, so cold food please bab. You can book in advance via Eventbrite (please note the Eventbrite booking charge of 90p per transaction) or turn up on the day with cash – all proceeds go towards the winning project. Fancy joining the SOUP team? Could you be a SOUPer hero? Do you care about Birmingham? Want to help awesome projects make a difference to our community? Have skills in social media, admin, events or outreach? Birmingham SOUP are recruiting, all ages welcome, do you want to join the volunteer team? We’re having a SOUP Open Meeting on 21st May from 2.30-3.30pm (post-SOUP) at Impact Hub Birmingham, Walker Building, 58 Oxford Street, Digbeth, Birmingham, B5 5NR. At the meeting you can hear all about SOUP, how we organise ourselves and our future plans – including SOUP in a School and our Recipe Zines. Have you got an idea that could benefit from a little SOUP cash boost? We have had proposals from all sections of the community and projects big and small have been supported by the SOUP community. We’re looking for our 5th SOUP winner – is it you? Got a project that is in its early stages? Maybe it is just an idea? It might be running already; whatever stage your at with a project idea we want to hear from you! So far we’ve had a winner who makes cardboard beds for the homeless, a new arts venue looking for money to help decorate their space, a business that reconditions old bikes and an art event that aims to help migrants & refugees. All incredibly diverse but with ONE thing in common; they want to help the community of Birmingham and make the city a better, brighter place to be. SO if you have an idea you’ve got just under 24 hours to fill out our proposal form – we promise it is VERY easy. All the details are here. SOUP #4 – February 2016 – pics are UP! We have made it to SOUP number 4 and raised over £1500 for 4 very worthy community projects for the city. YAY! February’s SOUP was an after-work gathering (we like to alternate between Saturday afternoon’s and Thursday post work get togethers) which saw Nyrees from Nettlefest, Sharon from The Square Peg Foundation, the Beyond Borders team from the Gap Arts Project, and the delightfully colourful team from new YouTube channel The Vibe, all pitch for the £315 door takings. This month’s voting was a close call but it was Gap Arts that caught the audiences imagination! Thanks to everyone that came along on Thursday evening to support the projects, to LOAF who once again kindly donated bread to go with our delicious SOUP (red lentil dahl and cauliflower &roasted red pepper this month incase you missed out) and Impact Hub Brum for their kind hospitality and use of their amazing space! Our next SOUP event will be on Saturday 19th March (doors 11am for a 12noon start). Everyone is welcome so feel free to bring the family – kids get a vote too! We’ll be serving up a SOUP lunch and sharing food and snacks donated by guests. If you have been inspired and have a project idea that benefits the community of Birmingham then why not head over to our ‘Submit a Proposal’ page. Deadline for the next event is Friday 4th March. Thanks to Ming for the great pics. Last night was our 4th Birmingham SOUP at the glorious Impact Hub Birmingham. The project with the most votes was Beyond Borders from The GAP Arts Project who are working in collaboration with residents of Birmingham to produce an arts event in response to the border crisis. ‘Using the subject of borders as a starting point we want to raise awareness about the circumstances that refugees and migrants are faced with both when attempting to enter and living in the UK. We are organising a week long exhibition from 9-11th April at Centrala, which includes a series of talks, workshops and performances in various art forms. Our programme will seek to bring people together from all background so that we can share our experiences, question our understandings, and learn from our interactions with each other. They took home the prize fund of £315.95p towards this brilliant project and will come back to a future SOUP to tell us how they got on. If you’d like to submit an idea/project at the next SOUP on March 19th then check out our submissions page. It’s really very easy!